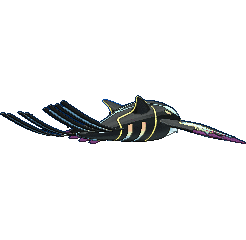 Kyogre in game: 1,197 Who? Important notice! 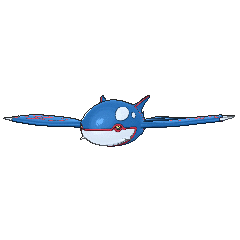 Pokemon Kyogre is a fictional character of humans. Kyogre possesses the ability to expand the oceans. In ancient times, it came into conflict with Groudon, a Pokémon with the ability to expand continents. 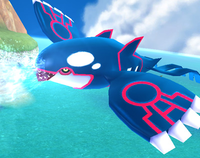 In Pokémon Sapphire, Emerald, and Alpha Sapphire, Kyogre is sought after by Team Aqua as part of their plot to compose more habitats for aquatic Pokémon by raising the sea level. Primal Kyogre is similar to Kyogre, but it grows to more than twice its usual size. Its skin color changes to a darker shade of blue. The four trailing parts of its tail are considerably longer and flat at the ends, and each have half-translucent webbing down the middle. Its forehead now has the α symbol, which is connected to the two large oval-shaped spots and tail, and light blue α symbols are seen on each pectoral fin, connecting to the outer nails with a red marking connecting to the inner nails. The red stripes adorning its body become light blue. There are two yellow shaped symbols inside the oval-shaped spots. 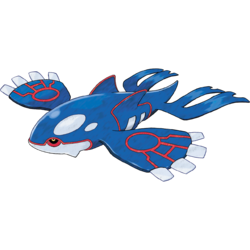 The white parts of Kyogre's body, as well as the areas between the markings on the pectoral fins, become half-translucent. A mysterious golden light glows from within Primal Kyogre's body. In the anime, Primal Kyogre is said to have widened the seas by a large margin simply by taking a swim. Kyogre is said to be a powerful Pokémon, having control over the element of water and rain to have quenched areas of the world plagued with drought and to have expanded the seas. Kyogre is normally calm and peaceful, but if it meets its rival, Groudon, Kyogre will engage in a cataclysmic battle against it. 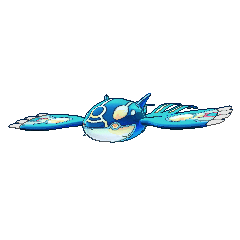 In the Mystery Dungeon series and core series, Kyogre is able to fly. 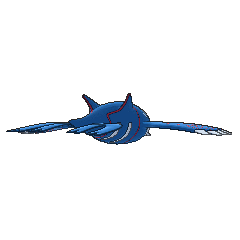 Kyogre generally lives deep in the ocean, and is said to rest in a deep trench. 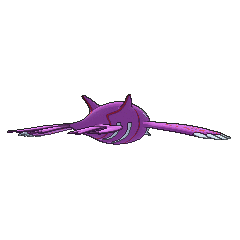 Kyogre is the only known Pokémon capable of learning the move Origin Pulse. Kyogre's first anime appearance was in Gaining Groudon. Team Magma had captured Kyogre but didn't have the correct orb to control it. Team Magma planned to make a trade with Team Aqua, who had captured Groudon. The trade was about to be made when Archie decided to use Kyogre to destroy everyone, including his fellow henchmen. The battle between Kyogre and Groudon occurred during the following episode, The Scuffle of Legends. A Kyogre appeared in the movie Pokémon Ranger and the Temple of the Sea. It had appeared along with countless other Water Pokémon when Ash replaced all of the Sea Crown's crystals. However, when The Phantom attempted to make all the Water types panic using supersonic waves from his ship, Kyogre too was part of the ensuing commotion. Manaphy calmed them down using Heart Swap to rid the Pokémon of their confusion, and some Wailord broke open The Phantom's ship, followed by some Chinchou swimming into the opening and short-circuiting the ship. Kyogre then used Hyper Beam on the ship, destroying it. 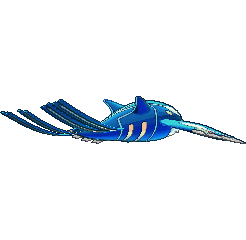 A Primal Kyogre appeared in Mega Evolution Special III, where it went on a rampage and battled with Primal Groudon. It also fought Steven's Mega Metagross, and was almost defeated by it until Metagross was defeated by Mega Rayquaza. It reappeared in Cloudy Fate, Bright Future! and The First Day of the Rest of Your Life! in the form of flashbacks. A Kyogre and a Primal Kyogre appeared in the second XY series movie, Hoopa and the Clash of Ages, as one of the many Legendary Pokémon summoned by Hoopa. Kyogre made its debut in the opening of Jirachi: Wish Maker. Kyogre makes a cameo in the introduction of Destiny Deoxys, The Rise of Darkrai, Giratina and the Sky Warrior, and Zoroark: Master of Illusions. 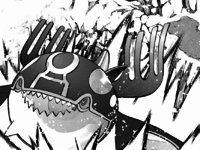 A Kyogre appeared in SM005 as a fantasy. A wild Kyogre appeared in The Cavern, where it was awoken by Archie inside the Seafloor Cavern, who used the Blue Orb to turn it into its Primal form. It escaped the Cavern and swam through its surrounding waters and surfaced above the ocean before composing a massive storm, threatening to destroy Hoenn. It was last seen attacking Archie and other members of Team Aqua when he tried to calm it down. In the Emerald chapter, Guile Hideout succeeded in having Jirachi breed a Kyogre monster made of seawater that nearly sank the entire Battle Frontier. Pokémon Pinball: Ruby & Sapphire: Kyogre is the focus of the second Bonus Field on the Sapphire Field. Kyogre will first use Sheer Cold to freeze the ball in place. It will then compose whirlpools to trap the ball further. Finally, it will dive into the water to evade being hit completely. However, air bubbles will appear where it is about to rise out of the water. Kyogre must be hit 15 times in three minutes to win. After beating the round twice, Kyogre will be captured. Kyogre has the power to compose massive rain clouds that cover the entire sky and bring about torrential downpours. This Pokémon saved people who were suffering from droughts. It took to sleep after a cataclysmic battle with Groudon. After long years of feuding with Groudon, it took to sleep at the bottom of the sea. It has the power to control water. Legends tell of its many clashes against Groudon, as each sought to gain the power of nature. Kyogre may be based on the Hebrew legends of Leviathan, the unconquerable primal master of the sea. Its counterparts were Behemoth and Ziz. Just as Kyogre is in conflict with Groudon, it was said that at the end of time Leviathan and Behemoth would start a battle that would kill them both. The Hebrew word for Leviathan is now used for whales in modern Hebrew, which may be why Kyogre's appearance also draws inspiration from whales, especially the orca. 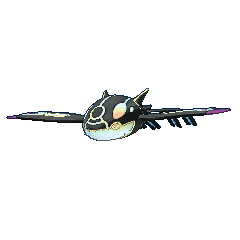 Kyogre and Kaiorga may be a combination of 海 kai (ocean) and orca (a species described as a whale, but is more closely related to dolphins). Notably, it may also involve 海王 kaiō (king of the sea), which are the first two characters in 海王星 Kaiōsei (Neptune).